After being missing for two years, five year old Emma has been returned to her family, who are struggling to adjust, especially her mom Megan. Megan is terrified of letting Emma out of her sight. Her eldest daughter feels guilty, her middle daughter resentful. Her husband, Peter, seems to be losing himself in work and, Megan fears, the arms of his attractive business partner. As for Emma, she is trying to readjust at the same time as dealing with the loss of the only family she remembers – Dottie, the elderly woman with Dementia who took Emma thinking she was her granddaughter and is now dead, and Jack, who Emma thought was her grandfather. Jack is still alive but barred from seeing Emma. He had no idea what his wife had done, believing she had rescued Emma from their drug addict daughter. When he found out, he returned her to her family. Now he’s alone. It might not be so bad for Emma if her mom could let go but she can’t. She tries to dress Emma differently, pretends to mail pictures Emma draws to Jack, and refuses to say either Dottie or Jack’s name in her house. The fact that this hurts Emma doesn’t seem enough to stop her, neither does the fact that her other daughters are also hurting and her husband is pulling away. In fact, Peter is keeping a big secret from Megan. And so is Emma. Both worry what will happen when Megan finds out. 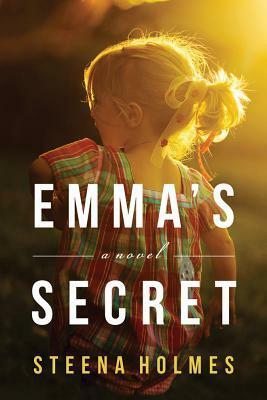 Emma’s Secret is the follow-up to Finding Emma, which I’d really enjoyed; I had felt for Megan, her family, and for Jack (an innocent victim). I read this book because I wanted to find out what happened next and was really looking forward to it. Unfortunately, what happened is Megan started to annoy me. As a parent myself, I understood Megan not wanting to let Emma out of her sight but I didn’t understand why she wouldn’t do anything and everything she could to help Emma adjust, including buying her dresses she liked to wear vs. jeans and tops she felt were “so Emma” or talking to her daughter about her life with Jack and Dottie so she could understand what happened to her and how she felt about it. The answer to the why is, I suspect, that Megan was suffering from some type of trauma herself after spending two years searching for Emma and then not knowing what to do when she finally gets her back but this wasn’t really explained well. In Finding Emma, I mentioned the simple style of writing but said it didn’t detract from the story. Here, it does because whilst the first book was a simple idea, a mother not giving up on finding her child that could be described in simple language, this book – at least to me – is more complex, dealing with the aftermath of a kidnapping for all concerned. To me, this book felt like it was skimming the surface, which I think is a shame. The other let down for me was that an emotional element was missing. I had felt for Megan in Finding Emma, knowing her daughter was so close but just out of reach for years, but here there wasn’t that imperative and nothing really tugging at the heart strings. Holmes tries but it doesn’t work as well, leaving me feel like the story was forced. Another shame because I think it could have been so much more. Overall, this book was great for what it was and when I read it (on holiday) but I do feel somewhat let down after enjoying the first of the series so much.